I've been working on this book on and off for two and a half years, and finally it's out -- kind of. The Kindle edition is available on Amazon (and its various local iterations), while the paperback edition exists in a sort of quantum state somewhere between being available everywhere and not existing at all. Once Amazon and other booksellers have processed it and updated their web sites, the probability waveforms should resolve themselves and it will exist in something more than a theoretical state. The initial idea for the book came from the publisher, Awai Books, who wanted to publish a collection of my Japan Times Strange Boutique columns in a single volume. Given how long ago I'd written a lot of them and how unsure I was about just how much I really felt I could stand by the opinions I'd held at the time, I swiftly returned with the counteroffer that I would write a fresh book, covering the same broad topics and linking them together into something that would give a broad overview of the music scene from a number of angles. I said I'd have it ready in six months, so that's something we can all laugh at now. The emphasis of the book is on using my own experience in the Tokyo indie scene over the past 10-15 years -- as an event organiser, label owner and DJ -- to provide a framework for understanding the music scene as a whole, and as a result, it's not so much about discussing specific important bands in depth as it is using bands illustratively to establish a context that will help you make sense of pretty much any Japanese music you encounter. It's also in the nature of the book's contemporary setting, and an idea embedded in the title, that whatever I pick out for particular mention are likely to be gone in a wisp of smoke before you even have time to get used to them. Already in the time between writing the first draft and publishing the book, a lot of the artists I mention in the book have "quit their bands", their music consigned to the scene's hopefully now not entirely forgotten past. 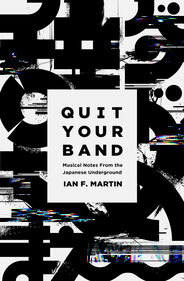 One band I mention briefly in the book, You Got A Radio, chose Quit Your Band! 's release day to play their final show. A coincidence, as far as I know, although a fitting one, given the significance of November 25th in musical history. On the other hand, another band I discuss in the book -- indeed, the band whose dedication to their own demise gave the book its title -- chose to re-form during the book's long gestation period, at least for long enough for my Call And Response label to hustle them into the studio and record an EP. I describe a teenage Nakigao Twintail performing at Utero in Fukuoka (a venue since closed down and relocated, such is the transient nature of even the scene's bricks-and-mortar institutions) as a rush of energy that helped revitalise me during one of my own many slumps, and their re-formation in Tokyo more recently helped kick me out of another one. Bands like that are precious and it's to them that this book is really dedicated. Hey man, congratulations on the book. I follow your writing and recommendations from half across the globe and wish you the best. Thanks for reading. It's always nice to know there are people out there who care! A wonderful novel. I am reading this for a college course in Analytical writing. This is a great post! Thank you for sharing with us!